Sisters Elaine Rillamas and Gwen Muranaka. Elaine passed away on Dec. 25, 2016. A few weeks ago I flew to Hawaii to say goodbye one last time. These journeys started when I was little, back then the Continental flight attendant would give me shiny pilot wings, as I was flying solo to see my big sister Elaine. Because she was quite a bit older than me when she moved, my mom wanted to make sure we shared a sisterly bond. So almost every year I’d be on a plane to Honolulu. I’ve seen her go from a young, independent woman in a cramped apartment in Honolulu, to a mother raising two sons with her husband on the North Shore. And so — all these years later, flying once more across the Pacific — we came to this moment to say goodbye. These past years have been painful. Her health started to decline almost 10 years ago, with a neurological disease much like ALS or Parkinson’s. At first she would lose her balance and then her limbs became stiff and she was unable to move. It seemed particularly cruel that although unable to move, she continued to endure terrible pain. Elaine lived in a nursing home in Kaneohe for her last years, maybe the youngest person there. Every time I would go, I walked past these seniors in their 80s or 90s who could have been her parents. Unable to move more than her head, her long hair spread behind her, she would always smile widely and say, “Hi Gwen” and we would reminisce about family thousands of miles away. She was my hero. I think of the simple pleasures that she missed: the little mundane things we all take for granted. Taking a hot shower, going to the supermarket, sitting up and stretching. But she found joy and gratitude in small things; I will be eternally grateful to the staff at AlohaCare nursing home. I recall a volunteer, a middle-aged haole woman, would come and paint her nails and the nurse’s aides would gently put flowers in her hair. If there is one thing I learned from my sister, it is simply LOVE. Through their years together, Elaine and her husband Keawe were so devoted to one another, from those early years in that small apartment on Piki Street in Honolulu to now. In both tough and good times, they stood by one another. Keawe has been by Elaine’s side — to feed her, hold her hand, talk story — to be the devoted, loving husband. I think that’s why when I married my husband Eric four years ago, I wanted to get married at Haiku Gardens, where she had married decades earlier. 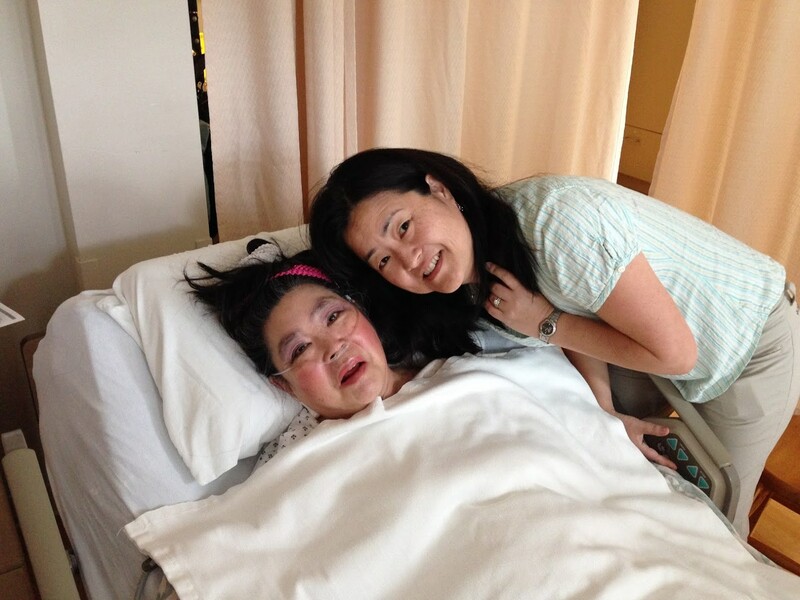 I asked Elaine to be my matron of honor and even as sick and in as much pain as she was, she said she would. It is a beautiful place, surrounded by flowers and a pond. But the main reason I wanted to get married there with our friends and family was if my marriage could be as filled with love as Elaine and Keawe’s, well, we would be so, so lucky. I’m still processing all of this. It’s strange to return to Hawaii, a place that has been like a second home for my entire life, and now feel this emptiness. It was also strange while we were in Hawaii to hear what was happening in our country — to feel the anger and dissonance. We flew to LAX in the hours after President Trump signed his travel ban and by the weekend thousands had gathered to protest. It is a poignant song of lament and longing written by a woman, Queen Liliʻuokalani, the last monarch of Hawaii. My sister left California to become a woman of the islands — graceful, vulnerable, loving and strong. Aloha Oe my dear sister, until we meet again. A big thank you to Kelsey Iino, who suggested the Executive Order 9066 series that is running in the pages of The Rafu. We have received many wonderful responses and it’s clear that the 75th anniversary has struck a nerve. It is Kelsey’s generation that will take this story of the Japanese American community forward and these personal stories are vital for the country to hear as it debates issues of national security, civil liberties and free speech in the Trump era. In moments like this, I sometimes wonder — what would George “Horse” Yoshinaga think about all of this? My best guess is he would support measures that he felt would keep the country safe and be less concerned about the civil rights implications. Of course he’d say it in a more clever and funny way than I just did. I hope one day he expounds further on this. We do tend to hear more from left-leaning folks but the more conservative side of our community is out there as well. Although when it comes to the president, the ouster of Hawaii State Rep. Beth Fukumoto, a Republican, from her leadership position, indicates there are divisions such as gender that go beyond the traditional factions of left and right. This E.O. 9066 makes me think of my mom, Julia Taniguchi Uriu. She died before President Ronald Reagan signed the apology in 1988, so she never received that small measure of justice. There is no doubt that the incarceration changed the trajectory of her life. She became a teacher and I remember she once told me how she saw JFK speak at the Coliseum. My guess is she would be marching today.